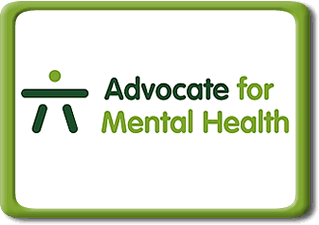 As the founder and administrator of several groups, blogs and pages online that deal with mental illness, I am often asked how someone can help or what exactly is an advocate. 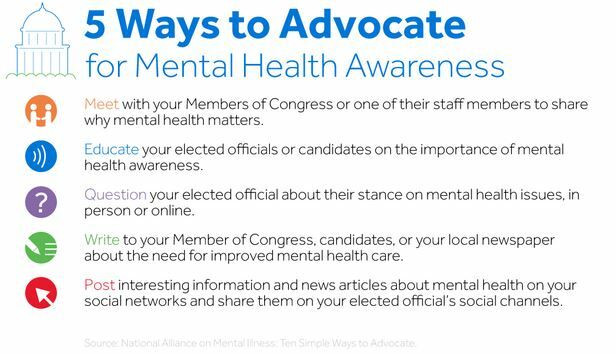 There are many ways a mental health advocate can get involved and help to make a difference. Sometimes it is simply to take care of themselves because they have a mental illness and sometimes it is helping a loved one or friend who has a mental illness. This is not always an easy task and those advocates should be commended. There are other ways too as stigma regarding mental illness is common and mistreatment of those inflicted with a mental illness are common. There are many famous mental health advocates and people who are doing things to advocate for the mentally ill on a larger scale. However, in order to be considered to be an advocate, you don’t have to change policy or be well-known. There are many things you can do to help change the mental health system and the stigma surrounding mental illness. It might be as simple as letting someone know that you have a mental illness and are not ashamed of telling them. It could be that you have accomplished in spite of having a mental illness and letting others know that. It might be sharing that a family member has a mental illness and you are not ashamed of admitting it. If you want to get involved on a larger scale, there are several organizations that deal with trying to change how the mentally ill are treated, perceived and help to educate others about the various mental illnesses. There are politicians and famous people who have spoken out about mental illness. You could simply write to them and let them know that you appreciate it. Send an email or call a politician, someone in the media, or a famous person in regards to your opinions, experiences, and ideas how to change things in the mental health system and/or make a difference in the stigma that I think is more discrimination. Start a FB page or page, a Twitter account, start to blog, etc. to help raise awareness and offer support to others inflicted with a mental illness or others inquiring about it. Join an organization that deals with mental health or illness. Some people lead groups, some show up to offer support, others spread the word about the organizations. Some such organizations are NAMI, BringChange2Mind, DBSA, Mental Health America, Young Minds Matter, NEDA, Healthy Minds. Give them a call and see how you can get involved. For more information and websites and organizations visit my Pinterest board concerning these. Be Vocal Speak up for Mental Health. 20 Responses to What can a mental health advocate do to help people with mental illnesses? Thank you for this article. It really helped clarify for me all of the ways in which we can (and already may) battle stigma and advocate. It touched because it made me think of friends who have stood by me. It also made me think of my own journey and the gathering of courage I have tried to do. It helps to hear that even the smallest of steps like coming out to a close friend (which is a big deal for a lot of us) matters. Truly matters in the long run. Join me at bipolarfirst@wordpress.com where I am currently trying to contribute to this battle against stigma. Thanks again for validating our efforts. Another great and informative post. You do amazing things when it comes to advocating for those who have mental illness. Continue the awesome work!! !